You are here: Home / News / Democrats Gun Control Goes Stealth. 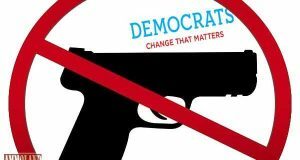 Democrats Gun Control Goes Stealth. (ThyBlackMan.com) The horrific massacre at the New Zealand mosque has incited demands for gun control there, but surprisingly not here in the United States. The contestants for the Democratic presidential nomination have been remarkably silent on the issue of the Second Amendment. African Americans should consider the present political atmosphere before deciding to give up their guns.We must answer the real question which is who is here to protect us from the crazy white supremacist, and white nationalist? We don’t trust them because political power is lethargic and responds after a lawless act has occurred. We know that we’re on our own to be victims or to defend ourselves with guns until the authorities arrive. We haven’t solved the problem of political lethargy. This is a dangerous slowness within which many Americans have been grossly maimed or have lost their lives. I believe that most gun owners aren’t unreasonable fanatics. The appetite for self-preservation is a strong, natural controller of human behavior. The will to live is as natural as sucking in your next breath rather than passing out from a lack of oxygen. We don’t have claws or fangs. We compete for survival with other things in nature. The invention of the gun was inspired out of man’s desire to overcome his inferior physical position in nature. Nature’s law of the survival of the fittest also accounts for our hunter-gatherer instincts. Guns help us to maintain our freedom and to stay at the top of the natural food chain. A gun is a sacred tool invented out of our imagination and longings to escape the dangers accompanying frail mortality. We longed for a superior weapon that allows us to have control over nature. The gun makes real the superhuman ideas of Western European mythologies relative to patriarchal protection that previously found expression through the telling of ancient stories about the powers of gods, such as Prometheus’ fire, Thor’s hammer, Zeus’ lightning bolt and Poseidon’s trident. Consider visiting a gun shop to study the various forms of guns, and possibly fire one. Study its symmetry. Contemplate the speed and accuracy of its projected missiles. Feel its power as you squeeze the trigger. Smell its odor and the odor of the gases it emits. Think about the sophistication of its design, run your fingers across its components and feel how it is thoroughly orientated to the human anatomy. Is it any wonder why recently suggested changes in gun laws in America were first upsetting, and then defeated? A gun is tied to man’s sense of being and self-preservation just as much as his need to quench his thirst or feed his hunger. Putting all economic considerations aside, the gun is representative of man’s desire to survive his hostile environment. It is a form of accessible security that he can hold in his hand, point like a magic wand and make other perceived things react. Ideally, America can be “heaven on earth,” but realistically it isn’t. The current laws governing our freedom to legally buy and sell guns are sufficient. The majority of Americans are still alive, and that’s because we haven’t killed ourselves off with guns.